At last year’s Le Grand Fooding 2010, Seersucker’s chef/owner Robert Newton showcased his Tennessee-Style Fried Chicken. If you’re looking for that post, well… you know what happened (I’ll try to re-write it one of these day). Anyways, back to his fried chicken. It was one of the best things I tasted all night and I went back for seconds. That finger licking goodness had me dreaming and drooling ever since. 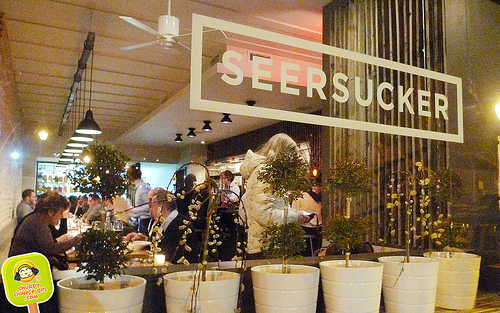 Seersucker is a warm neighborhood joint, right off the F train in Carroll Gardens. Serving seasonal Southern dishes. Friendly and casual. Modern and traditional. Old and new. Wondering how much my buddy J love his fried bird? Well, he got fried chicken pjs for Christmas one year and can eat a whole bucket, his record is 16 pieces! Yes, double digit. One time, he couldn’t resist the aroma of his take out and therefore dinner started on the street, with an umbrella in one hand, under the rain! Yeap, unbelievable! 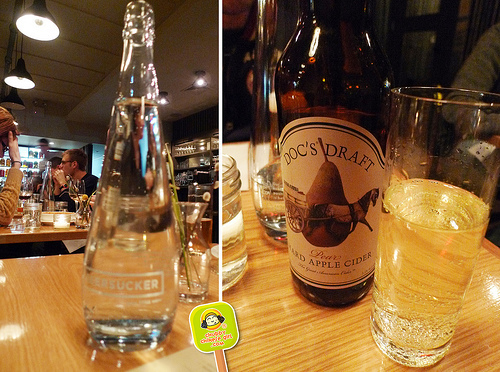 I choose Doc’s Draft Pear Apple Cider to wash down the spicy fried chicken about to come ma’ way. The boys got beer instead, another great way to cool off from the lip smackin’ heat. Right in front of me *drool*. Half a bird, fried to perfection. Two pieces of soft white bread, buttermilk dipping sauce, potato salad and coleslaw. For $18. Fried to order, unlike “that place”, this is worth traveling for. The coating has this extreme crunch, the kind that would wake up a sleeping baby. There’s a good amount of cornmeal in the batter mixed with some flour, which gave it that distinct crunch and grainy texture (loved that). Loaded with cayenne pepper, black pepper and other spices. The chicken juicy, ohhh sooo juicy. Ohhh so juicy that they’ve anticipated it with two pieces of white bread underneath to soak it all up. Though the breast meat was moist and flavorful, I’m still a thigh and drumstick kinda gal. Dip it all in the creamy buttermilk and stop talking. Just enjoy. Close your eyes if you must. 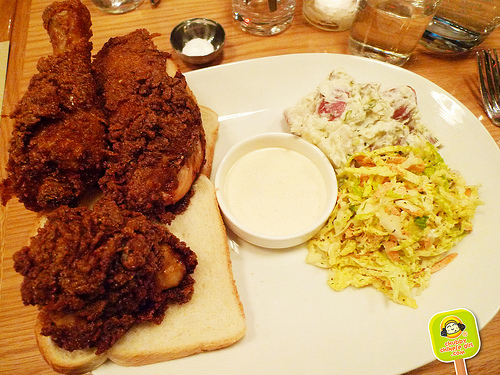 The sides were good, but honestly I can’t remember much, I was too busy concentrating on the fried chicken. And it’s all a blur to me at this point. They were lightly dressed and not too heavy, yet comforting. For dessert we shared their Warm Apple Crisp, served with Blue Marble sweet cream ice cream. This is like a mix between an amazingly chewy and crunchy oatmeal cookie and warm apple pie. 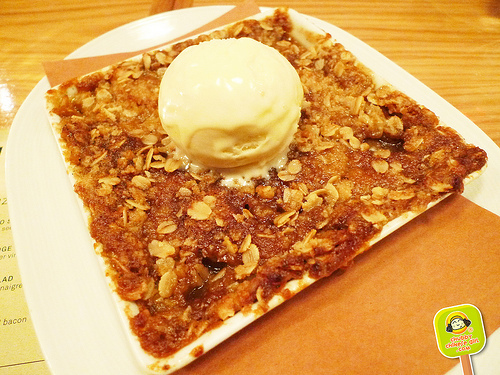 Buttery sweetness is contrasted by the subtle tartness in the apples, the warmth is then cooled by creamy ice cream. It’s like the ying and yang of dessert. Like any baked good, the crust all around the edges were the best. 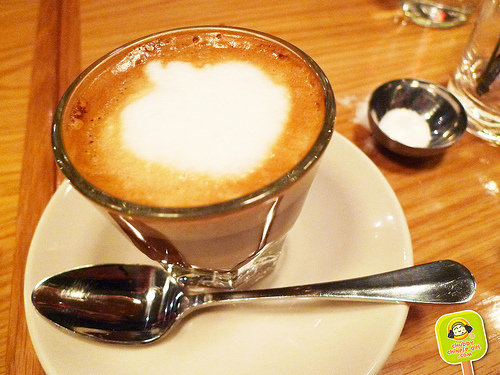 End the night with a beautiful cup of cortado or chamomile tea. And all our tummies were happy. There’s a pick up line “Are you from Tennessee?” “‘Cuz you’re the only ten I see”? 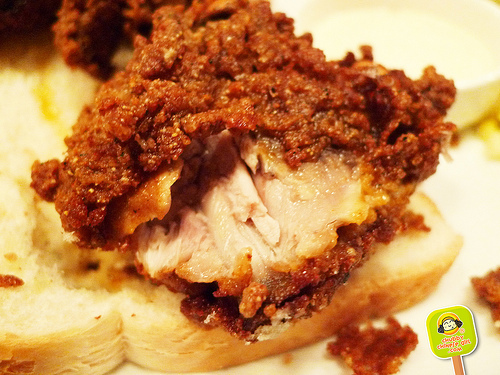 Well… this Tennessee fried chicken is definitely the only ten I see and tasted. I can’t wait to go back for lunch, dinner and brunch in my very near and yummy future. 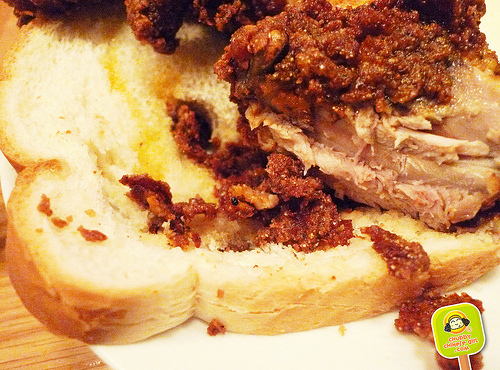 You had me at "crispy fried chicken." Who needs sides?! Thanks for this post! I wanna try this soon!!!!! I am new to your blog and was wondering do you ever cook? I used to edit a journal in the 1980s called Cooking and Typography. If the internet had been invented it would have been a blog. Design, Typography and Cooking have always been my obsessions. I believe that all they share the same aesthetic. I love Seersucker! Never knew about their Tuesday fried chicken dinners though. Thanks for the heads-up!